Customize The Taste Of Your Medicine! A safe and easy way to help children take their medication ! At our core, we are devoted to helping children (and you, their parents) avoid that all-too-common struggle to take medicine because it either tastes awful or because it’s just no fun to be sick. Not sure if you came here looking for a new best friend, but you just found one. Let’s take a quick trip down memory lane. Remember what it was like to take medicine when you were a kid? Fond memories, are they? You might be surprised to learn that not much has changed since then. The drugs you were taking to get better as a child are pretty much the same ones your child will be taking to get better now. You know what else hasn’t changed? Kids still really don’t like taking medicine. Except now parents (that would be you) have FLAVORx on their side and the tide has officially turned in the battle to get kids to take their medicine. Yeah, he was the Surgeon General of the United States. America’s Top Doc. Pretty big deal. We just felt it was time to pull out the big guns, you know, in case you weren’t taking this stuff seriously. If your child fights with you to the point of exhaustion and still spits the medicine back out when you manage to pin him or her down, what’s the point? There’s a better way to get kids to take medicine. The FLAVORx way. Find A Pharmacist That Uses FLAVORx! Finding FLAVORx for your child’s medicine couldn’t be easier. Simply call or visit your pharmacy of choice and ask them if they can customize the taste of your child’s medication with FLAVORx. With more than 40,000 pharmacy partners, it’s pretty likely we are just around the corner! 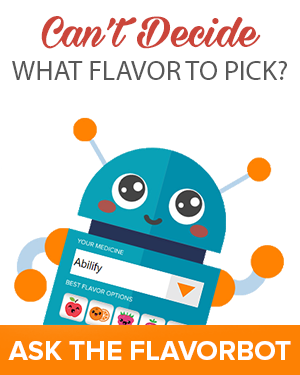 Or, even better – use our handy Pharmacy Locator tool to locate a pharmacy near you who is committed to giving your child a choice in how their medicine should taste!